Advances in computers and personal navigation systems have greatly expanded the applications of Kalman filters. A Kalman filter uses information about noise and system dynamics to reduce uncertainty from noisy measurements. Common applications of Kalman filters include such fast-growing fields as autopilot systems, battery state of charge (SoC) estimation, brain-computer interface, dynamic positioning, inertial guidance systems, radar tracking, and satellite navigation systems. Brown and Hwang's bestselling textbook introduces the theory and applications of Kalman filters for senior undergraduates and graduate students. This revision updates both the research advances in variations on the Kalman filter algorithm and adds a wide range of new application examples. The book emphasizes the application of computational software tools such as MATLAB. The companion website includes M-files to assist students in applying MATLAB to solving end-of-chapter homework problems. 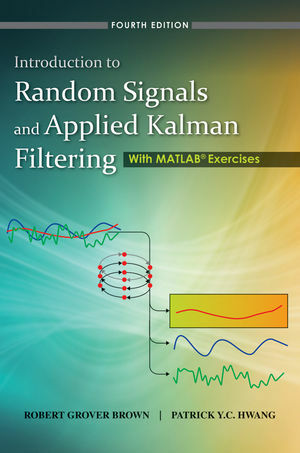 Robert Grover Brown and Patrick Y. C. Hwang are the authors of Introduction to Random Signals and Applied Kalman Filtering with Matlab Exercises, 4th Edition, published by Wiley. Later chapters will include a significant amount of new material on nonlinear filtering and sampling Bayesian filters, the "Go-Free" concept as related to complementary filtering, and applications such as simultaneous localization and mapping for autonomous vehicles, inertial navigation systems and global satellite navigation systems. • Leading textbook devoted to Kalman filtering. Competing titles are more research-oriented reference books. • Emphasizes use of computational software, especially MATLAB®. Book Companion Site contains problem solution M-files for the end-of-chapter MATLAB® problems.